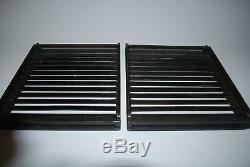 JENN AIR KENMORE WHIRLPOOL Range Oven Grate Grill 04100054 or 205352 12001178. 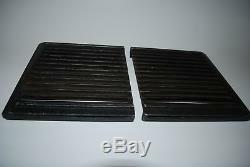 JENN AIR KENMORE WHIRLPOOL Range Oven Grate Grill, part # 04100054 or 205352. Set of 2 as showns. This part is compatible with the following part #s: 12001178 AP4009851, , 400192, 4381641, 4381803, 7-4544, 704544, AH2002886, EA2002886, PS2002886, W10116806, Y, Y704544. Made by Whirlpool, which makes parts for Whirlpool, Kenmore, Maytag, KitchenAid, Jenn-Air, Amana, Magic Chef, Admiral, Norge, Roper, and others. Please contact me with your appliance model # if you are unsure if this part is compatible with your model. If you need this part, please don't hesitate in purchasing it, as it may not be available tomorrow and it may be awhile before we get another one in. The Following is a list of appliance model #s that are reported to use this part (or a compatible part #) can work in. If a large list of appliance model #s appear, use Ctrl + F to search for your model #. Please note this part may work in model #s not listed here. Also, manufacturers have been known to install different parts than what they report are in a specific model #. As a result, this list is for reference only and is deemed accurate, but not always 100% reliable. To be 100% sure, it is always recommended to visually verify the part # on the part in question. 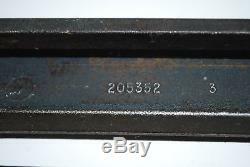 Please contact me with your appliance model # if you are unsure if this part is for your machine. SVD48600P SVD48600W CG206B SEG196 CVG4280B SVD48600B CG200B CVG4280W SVD8310S CVG4380B CVG4280S CG200 CVG4380P CVG4380W SC8720EDW0 CG206S SEG196W SC8720EDB0 12103 SEG196-C CVG4100B CG200L CVG316W CVG316B 12104 CG100B CSG9900AAE CVG4380PU CG206B-C CG206S-C SVD8310S-C CG206B-E CSG9900AAB CVG4380PF CVG4380PR SVD48600BC SVD48600PC SVD48600PF SVD48600PT 62912103 62912104 62920245 629CG200 AG150 CG106B-C CG106S CG106S-C CG206L CG206L-C CVG4380PD CVG4380PG CVG4380PK SC8720EDB06 SEG196W-C SVD48600PG SVD48600PK SVD48600PR SVD48600PU SVD8310SF SVD8310SG SVD8310SK SVD8310SR SVD8310SU. If your item arrived broken or damaged, contact me right away so I can take care of you! If you are not sure if a part is the correct one for your model # please submit a question with your appliance model # and I will verify for you. Did you receive a broken or defective item? If you need a part in a hurry, please double check that what you are ordering is in fact what you need. I Guaranty my parts to work , but I do not guarantee that it will fix your appliance. I try my best to accurately depict each item correctly. Please contact me if you have any questions before ordering. The pictures used in this listing are often stock images of mine and the item you receive may be slightly different, but will always be the same part #. This listing in only for the part # listed in the title. Just because an item looks like the one you are trying to replace, does not mean it is the same (or compatible). Please only go by the items part # when determining if an item is compatible for your appliance. If you are unsure, please contact me with your appliance model # and I can verify if it is the correct part for your appliance. I believe in the principles of Honesty & Integrity! If I wouldnt use a part in my own appliance, I wont sell it to you! If I ever make a mistake, Ill own up to it! Finally, I believe in open and intentional Communication. The item "JENN AIR KENMORE WHIRLPOOL Range Oven Grate Grill 04100054 or 205352 12001178" is in sale since Wednesday, August 16, 2017. This item is in the category "Home & Garden\Major Appliances\Ranges & Cooking Appliances\Parts & Accessories". The seller is "usedapplianceparts" and is located in Colbert, Washington. This item can be shipped to United States, Canada, United Kingdom, Denmark, Romania, Slovakia, Bulgaria, Czech republic, Finland, Hungary, Latvia, Lithuania, Malta, Estonia, Australia, Greece, Portugal, Cyprus, Slovenia, Japan, China, Sweden, South Korea, Indonesia, Taiwan, Thailand, Belgium, France, Hong Kong, Ireland, Netherlands, Poland, Spain, Italy, Germany, Austria, Russian federation, Israel, Mexico, New Zealand, Philippines, Singapore, Switzerland, Norway, Saudi arabia, Ukraine, United arab emirates, Qatar, Kuwait, Bahrain, Croatia, Malaysia.